MuShield has over 60 years of experience producing hydroformed parts out of mumetal magnetic shielding alloys, as well as other alloys such as aluminum, stainless steel and many other materials. From simple deep drawn cans used as dust covers to sensitive magnetic shielding for defense systems GPS’s, MuShield’s hydroforming capabilities are called upon again and again by our customers as a cost effective and repeatable solution. Read along as we discuss the benefits of hydroforming and go into detail about the process. If you have a design that you think may be a good fit for hydroforming, contact us at info@mushield.com or 603-666-4433. 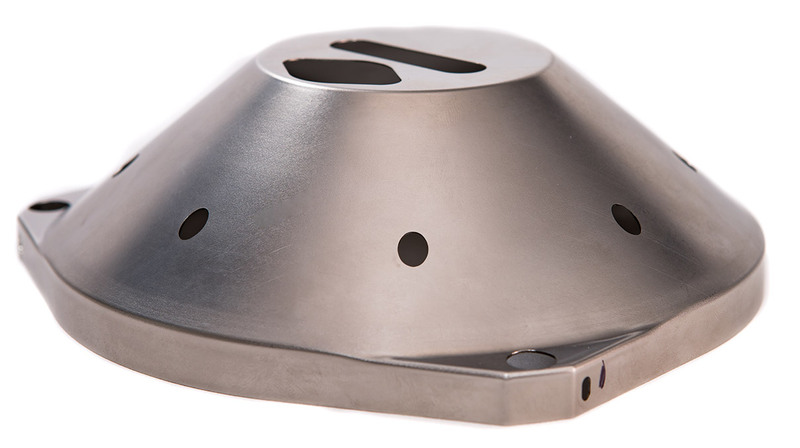 A hydroform machine utilizes a forming punch machined to the inner dimensions of the desired sheet metal part and can make both simple and complex sheet metal shapes. Hydraulic pressure (up to 15,000 psi) behind a specialized rubber diaphragm provides the force required to wrap sheet metal material onto the punch as drawing force and motion is applied. The resulting large radii on the finished part is preferred from a magnetic shielding standpoint because the magnetic flux permeating through the magnetic shield turns easily on large radii and eliminates any chance for flux leakage. Tooling cost is minimized since only one or two form punches are required for most piece parts and MuShield has in-house machines to build each tool, which will often last the life of the part cycle due to a hardening process done to the tool after it has been proven out in production. You will see consistency from part-to-part and production run to production run with tolerances of +/- .001″ on most dimensions. While MuShield specializes in hydroforming mumetal and other magnetic shielding materials, we are not limited to just those. We hydroform materials such as stainless steel, brass, aluminum, inconel and other alloys on a daily basis. If you have a design that you think would be a good fit for our hydroform, do not hesitate to contact us at info@mushield.com or 603-666-4433 to discuss your application further.